Introduce the wonderful world of birding to your students in this exciting hands-on introduction to bird watching. This field trip teaches young “budding birders” about bird adaptations and techniques to observe birds in the wild. 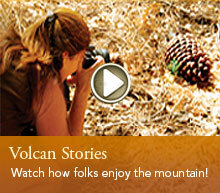 Data recorded by student observations will provide critical scientific information about the birds on Volcan Mountain. Students will learn through stories and games exactly what makes a bird a bird and the amazing adaptations birds have to help them survive and thrive in their habitats. They will play a migration game and “eat like a bird” in the Bird Beaks game. Then the students will borrow our binoculars and go bird watching with our guides to spy on all the feathered friends they can find and identify. Students will be empowered to continue to use their new scientific skills at school, home, or elsewhere. All recorded bird observations will be uploaded to the eBird citizen-science project at Cornell Lab of Ornithology — one of the world’s largest citizen-science databases. Contact Us to Learn More and Schedule Your Nature Adventure!